I didn't really have strong feelings about this test one way or another until yesterday, when it took up almost all of my time. I was scheduled to proctor between 8 and 10. I went to the library, where they told me I'd be testing one student who needed to be read to. We went up to a room where envelopes were being distributed and stood around for a while. One by one, kids were matched to teachers, who walked away to do whatever it was they were going to do. In the end, a bunch of colleagues and I were still standing there. We were sent down to a reserve room, where we sat around for two hours in case someone had to go to the bathroom. As far as I recall, the only person who did was me. Then we were released, and I focused on other things for a while. I don't recall what they were, because an hour or so later the complaints started coming in. It turns out that, somehow, no one bothered relieving a whole lot of people who were on the 8-10 shift. People found me and said their friends were sitting for a whole lot of time beyond when they were supposed to be relieved. I ran around and couldn't find administrators who could help. I relieved several teachers myself, who said things like, "Do I need to come back?" I said no, you've already done more than you were supposed to. Then there are these special needs kids, the ones who get time and a half and are read to. I was reading math problems to one. He asked me if I could explain them. That would be problematic, what with it being a test and everything. I told him the truth, which was that I didn't understand the questions either. The best I could do was read them. I was pretty happy I wasn't taking the test. I do recall that when I took the SAT, a million years ago when dinosaurs roamed the earth, that I did much better on the English section than on the math. I later met up with the teacher who I'd relieved. She told me the student had been asking for food. Teenagers tend to get hungry at times. He asked her if she knew whether anyone was bringing anything. She told him she didn't know. I know, though, that no one did. She also told me that he finished one part before time, and well before time-and-a-half. When that happened, she and the student had to sit there like scarecrows waiting for the time she marked in the book. NO, you may NOT go ahead, even if you're the only student in the classroom. I don't really know whether the student understood that part or not, because at some point in the math, he told me he was just guessing the answers and had no idea what they were. That was really disturbing to me. This young man has to sit here for six hours, hungry and miserable. He's taking a test he doesn't understand, and being made to sit for, I don't know, six hours of absolute tedium. To me, this seemed not only idiotic, but outright cruel. Of course, I'm not one of the geniuses who designs this test. I'm also not one of the geniuses who decided every high school student in NY City should take it. I don't know this young man. He seemed perfectly lucid to me. Were I in his place, I'd likely have the same questions and frustrations he did. I certainly don't know math any better than he does. Nonetheless, I think it's worse somehow to deprive teenagers of food. I eat breakfast in the morning. Lots of teenagers find that uncool, even thought they surely need the calories more than I do. 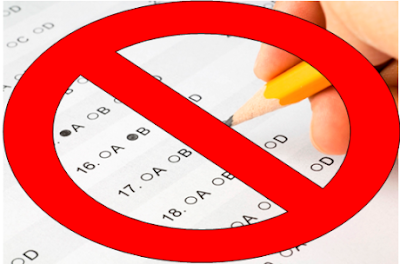 I don't believe the SAT can magically determine who does and does not belong in college. I don't believe knowing or not knowing a bunch of mathematical terms demonstrates your college readiness or lack thereof. Regardless, I would never, ever put that kid through what he went through. Then I think about another few dozen kids who, likely as not, are doing the same. It's pretty terrible. Thanks to Mayoral Accountability, every @NYCSchools junior will be able to take the SAT for free at their school tomorrow. No student should miss out on college due to the cost of an exam. That's nonsense. Plenty of municipalities with real school boards, as opposed to our fake one, manage to deliver the SAT to students. Maybe, if this mayor really wanted to change things, he could deliver tests to those who ought to take them. Maybe he could examine all the other crappy tests our kids are required to take and say, "Hey, what the hell is this all about?" If Bill de Blasio really had mayoral control, he'd be able to tell Eva Moskowitz and her test-prep till you pee your pants to take a long walk of a short Hudson Pier. Instead, she's paying herself over half a million a year, courtesy of NYC taxpayers. I don't want any student to miss out on college. But I don't want students wasting their time on excruciating, pointless activities either. Maybe that's why I'm a teacher instead of a politician.